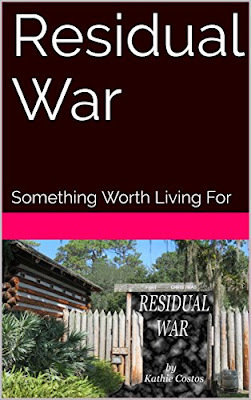 Don't forget my new book is based in Central Florida RESIDUAL WAR, SOMETHING WORTH LIVING FOR, takes place out at Fort Christmas, Lake Nona VA and the Lone Cabbage. This list includes the Veterans Day events that were provided to me. There MAY be others. *Send me your events – people cannot attend an event if they don’t know about it! And I’m a very poor mind reader! *Please share this information and events with your friends and interested others and attend. Post where appropriate. *Event information is concentrated mostly on the Central Florida counties served by the new VA Hospital at Lake Nona – Orange, Osceola, Seminole, Brevard, Lake and Volusia. Other events elsewhere are considered based upon uniqueness and groups best served. Theft Notice – Someone stole the month of October! It seems that the entire month vanished and skipped from September to November….. Lists are circulating with offers for free meals/discounts for veterans at businesses who are thanking them for their military service. Call ahead to verify their participation. Please remember to tip the eatery servers. “Thank-You” notes to managers are especially thoughtful to thank them for the offering / participating. A few kind words mean a lot as they would be more likely to continue support in the future! Avoid the confusion - Just a bit of a reminder - There is a difference between veterans and military. Sometimes people get confused that veterans were once active military but they are not officially serving anymore. And our military who are serving now and will one day be veterans. Retired veterans served a specified required time in service. All military retirees are veterans but not all veterans are military retired. Veterans Day honors all persons who once were in the military - especially the living. Formerly known as Armistice Day after WWI – 11/11/11 – Eleventh day of the Eleventh month at the Eleventh hour. Armed Forces Day is the third Saturday in May - it was established in 1950 to replace separate Army, Navy, Marine Corps, Coast Guard and Air Force Days. That is a day to pay tribute to men and women who ARE currently serve the United States’ armed forces. Memorial Day honors those who died while serving in the military; Observed on the last Monday in May. Election Day – Tues. Nov 8 – Become educated and exercise your civic privilege and responsibility – VOTE! Our local elections are especially important as they tend to have a more direct impact on us. Vietnam Huey Helicopter lift – Tues Nov 8 - Beginning at 9:30am a Vietnam Huey copter will be lifted 13 feet in the air and mounted on the monument pole at the Veterans Memorial Park at 411 Meadow, Leesburg, 34748. Gawkers and sidewalk supervisors are welcome! Dedication ceremony on Friday, Nov 11. (see below in Lake County.) Info: 352.314.2100 Don Van Beck, executive Director. Visit them on line at the Veterans Memorial www. lakeveterans .com In addition to the Huey Helicopter, there is a 15 foot wall for engraved names of our Vietnam Veterans. To request an engraving, they are accepting donations of $20 and will need the Vietnam Veteran’s DD-214. The office is located in the Southern Monument Studio Building at 404 North Boulevard (Hwy 441) in Leesburg, FL. Time is extremely limited to have the engravings complete for this dedication. Info: 352.314.2100 Don Van Beck, Executive Director. Thank you Peggy of AMVETS Post 2006 Auxiliary! The First Academy Veteran’s Day Celebration – Wed. Nov 9 – The students of Wounded Warrior Club of The First Academy would like to honor members of the Armed Forces. 10am in Faith Hall where the talented students will perform. First Baptist Orlando, 3000 S. John Young Parkway, Orlando, 32805. (North of I-4 and John Young Pkwy, exit 79.) Special guest Lt. General Benjamin Mixon and the UCF USAF ROTC. Info/RSVP’s appreciated for head count planning to 407-206-8748 Shared by Brian Rose. FAVOB After Hours – Wed. Nov 9–Florida Association of Veteran Owned Businesses (FAVOB) hosts this After Hours event of drinks, fellowship and networking. Twin Peaks Sports Bar 6-8pm at 8350 International Dr., Orlando, 32819 in southwest Orlando. Free for FAVOB members, $10 donation from non-members. Open to all civilians and veterans alike....You don't have to be a vet to support the veteran business community! 19 states offer contract preferences to veteran owned businesses. Florida is NOT one of them. Our goal is to change that in big business, our cities, and counties too. See FAVOB Facebook site and .www. FAVOB. org Info: Trish at marketing@ FAVOB .org Sponsors welcome! Thurs. Nov 10 - HAPPY BIRTHDAY, United States Marine Corps! 241 years of service since 1775. Thank a Marine, past or present, for your freedom! Semper Fi! Lake Brantley High School Salute – Thurs. Nov 10 – 10am – 10:30am at the Lake Brantley Football Stadium. 991 Sand Lake Road, Altamonte Springs, 32714 (Seminole County) The entire school populace will assemble in the Football Stadium by 10am. The Chorus sings the National Anthem, followed by a helicopter flyby. A patriotic speech is given that generally focuses on a specific group each year as well as faculty/staff veterans. The honored guests from the local community will stand in place while their bio is read. The Band plays a Salute to America's Finest. There is a gun salute followed by Taps. Veterans – arrive early and wear apparel that represents your branch and/or membership organizations. Homes For Our Troops (HFOT) - Thurs, Nov 10 - Watch HFOT on TV live on ABC's “The View” (check local listings) to follow the journey of Navy PO2 Tim Birckhead and learn about the life-changing gift he will receive from HFOT. This same organization has provided mortgage-free homes to several families in the Central Florida area. “Honoring Winter Park Heroes” - Fri. Nov 11 - 6th Annual Veterans Day Celebration honors all veterans at the Winter Park Community Center, Ruby Ball Amphitheatre at 721 W. New England Ave. at 9:30 am, organizations and services that offer resources specifically for veterans’ needs will have tables set up while the VFW Post 2093 Community Band entertains guests. The official program will begin at 10 am with musical tributes, anecdotal speakers, and recognition of veterans according to the various military branches served. Info: 407-599-3428. Veterans’ Day Parade in Orlando – Sat. Nov 12 – Beginning at 11am – 1pm, 80+ units will march in one of the largest parades in the southeastern United States. Floats, bands, military units and organizations, & more! Route goes south on Orange Ave. from Amelia St., turns east on Central St, turns north on Magnolia and past Lake Eola towards the Courthouse. Volunteers for the parade are very welcomed! Contact De at daila.espeut-jones@ zeltech .com for volunteering opportunities. SAR Meeting – Sat. Nov 12 – Descendants of America’s first veterans, the Sons of the American Revolution (SAR), meet at 11:30am at the Duxbury Room of the Mayflower Retirement Complex, 1620 Mayflower in Winter Park. Coffee social follows with lunch. Florida Society SAR President, Raymond Wess, joins the Central Florida Chapter and tells about the Order of the Cincinnati (he is also a member) which is America's oldest veterans' organization. It was formed by General George Washington's officers at the end of the war. Did you serve in the military? Honor your ancestors who also served our country at its beginnings with membership (But your military service is NOT required to join.) Info: Dan at catears@ centurylink .net or Don at donaldg100@ aol .com. Marine Corps Birthday Ball – Sat. Nov. 12 – This 241st celebration will be at the Rosen Centre Hotel in Orlando, 9840 International Drive, 32819. Cocktails begin at 6pm and the ballroom doors open at 6:45. At 7:30 the ceremony begins with dinner and dancing following that. Dress is formal. special guests. Interested persons can get more information at the Central Florida Marine Corps Foundation website: centralfloridamarines .org or thru Jan Baka 407.745.3029 during business hours or jan.baka@ ecs-federal .com SPONSORSHIPS welcomed! Only a few openings may be available. Semper Fi! Pilgrim and Patriot 5K – Sat. Nov 12 – The roads of Solivita in Osceola Co. support Honor Flight Central Florida with a 5k Run, walk, or roll. Freedom Park at Solivita, 395 Village Dr, Kissimmee, 34759. Register online before at pilgrimsandpatriots.itsyourrace .com or on the morning of the race until 8am. Start time: 8:30am. Veterans Day Ceremony – Fri. Nov 11 – 11am at the Sanford Veterans Memorial Park, 110 W Seminole Blvd, Sanford, 32771. Thank Ed Burford, Seminole Co. VSO! Veterans Day Celebration – Fri. Nov 11 – 11am at Altamonte Mall, Lower Level near Dillard's, 451 E Altamonte Dr, Altamonte Springs, FL 32701. Thank Ed Burford, Seminole Co. VSO! Veterans Luncheon and Concert – Sun. Nov 13 - The Military Support Team of the First United Methodist Church of Oviedo is hosting a free luncheon to the first 300 to RSVP. In addition, there will be bagpipe music, Posting of the Colors by the Oviedo HS JROTC, Missing Man Table ceremony, the National Anthem, etc. 12:30pm at 263 King Street, Oviedo 32765 in the church gym. (And see concert below.) RSVP to: MST_RSVP@outlook.com (that's MST(underscore)RSVP@outlook.com). If there are problems with this email address, RSVPs can be texted to 407.405.4120; all RSVPs will be acknowledged. Thank you, Lee Barnes! Musical Concert – Sun. Nov 13 - Beginning at 2:30 PM, the 70-piece Orlando Concert Band will be performing a "Salute to Our Veterans" concert. First United Methodist Church of Oviedo sanctuary, at 263 King Street, Oviedo 32765. This free concert is open to all, and usually plays to a full house. No RSVP is required for the concert. Thank you, Lee Barnes! Honoring Our Veterans – Sun. Nov 13 - A free event involving horses for veterans with demonstrations, discussions, games and interaction with the amazing Equine Crüe of The Zenerjen foundation. Two sessions, 9 am – noon and 1 pm - 4pm come for one or come for both; lunch provided by Tijuana Flats from noon – 1 pm, at 1180 N Hart Road, Geneva, 32732. RSVP required because space is limited. Call: Jen at 407-412-0252 or email jen@ zenerjen .org. Veterans Day Ceremony and Huey Helicopter Dedication – Fri. Nov 11 - 2pm the Vietnam Huey Helicopter and the Vietnam Veterans Wall will be dedicated at the Veterans Memorial Park at 411 Meadow, Leesburg, 34748. Everyone is welcome to attend this honorable event and dedication. On Nov 8th, beginning at 9:30am the Huey will be lifted 13 feet in the air and mounted on the monument pole. Gawkers and sidewalk supervisors are welcome! Info: 352.314.2100 Don Van Beck, executive Director. Visit them on line at the Veterans Memorial www. lakeveterans .com Thank you Peggy of AMVETS Post 2006 Auxiliary! Veterans Day Weekend Open House, Sat & Sun Nov 12 and 13 - The Valiant Air Command Warbird Museum will provide free admission to the museum for all military, active or retired. Also, ALL Florida residents will be admitted free – but please bring a non-perishable food item. Events include flybys, collection of vintage aircraft, plastic modelers and radio controlled modelers, and the opportunity to speak to former combat pilots. Car Club exhibits. (If you have a classic car that you would like to show on Saturday and/or Sunday, please contact the museum.) 9AM-5PM, Saturday and Sunday. Food and refreshments will be available for purchase. Space Coast Regional Airport, 6600 Tico Road, Titusville, 32780. Info: www. valiantaircommand .com Warbirds@ valiantaircommand .com 321-268-1941. 2nd Annual 5K Run/Walk – Sat. Nov 12 – “Represent (321) 5K” starts at 8am and proceeds benefit the AVET Project (which assists vets and military) and the Brevard Schools Foundation. Pelican Creek Estates, Poinsettia Dr., Satellite Beach, 32937. Contact henry.matta-garcia@ iapws .com 321-338-0070 or Marty at runsalot@ cfl.rr .com 321-537-3526. Super Moon – Mon. Nov 14 - Unique natural event - The Moon will be the closest to Earth since January 1948, and will appear up to 14 percent bigger and 30 percent brighter than an average full moon. This is the closest the Moon will get to Earth until 25 November 2034. Military night-vision goggles not needed! v Orlando VA Town Hall Meeting – Sat. Nov 19 –The Orlando VA Medical Center wants share what’s new at the site thru a Town Hall Meeting. In addition, they want to hear about your thoughts (positive and negative) and your concerns. 10am – 2pm at Concord Street Church Of Christ, 626 East Concord Street, Orlando, 32803. Spend some time with Mr. Liezert for an "Ask the Director" session. You will also have an opportunity to speak to the Veteran Benefits Administration (VBA) expert about your service connected benefits. Learn about the one topic no one wants to talk about - death benefits - The National Cemetery Administration will be there to answer questions. We will have Veteran Justice Outreach and several other counselors on site to serve our Veterans. If you are a Veteran and have not received your flu shot, we will have Orlando Staff onsite to provide the flu shots (ONLY AVAILABLE FOR VETERANS). If you are weak (unlikely, but you never know!) and hungry after the shot then you can go over to Eddie Jenkins and receive some free barbecue. Info: “Annie” at ellamay.artis@ va .gov 407-646-5500 x27246. Fisher House at Lake Nona – Wed. Nov 30 – Groundbreaking for the Fisher House on the property of the Orlando VA Medical Center. This building, like the others located nationwide near military medical facilities, provides nearby housing for veterans and/or their families while care is being given. 10am in the vicinity of 13800 Veterans Way, Orlando, 32827. Follow signage. The facility receives no VA or federal monies – the Fisher House's run by donations and volunteers. Shades of Green – This resort on Disney property for military and DOD personnel has some very tempting rates, especially during the months of January and September. The “Salute to Our Veterans” program is designed to give all military veterans who have received an honorable discharge (proof required & verified by current DD-214) Check out the website at www. shadesofgreen .org or call 1-407-824-3400. On-Site Employment Services - Orlando VA Medical Center offers On Site employment services every Tuesday from 10am to 2pm at the Orlando VA Medical Center, Lake Baldwin, 5201 Raymond St, Building 503, Room B107, Orlando, 32805; an appointment is suggested, walk-ins are accepted. For an appointment, call 407-646-5500 ext. 27246. Giving Tuesday – Tues. Nov 29 –Celebrated on the Tuesday following Thanksgiving and the widely recognized shopping events Black Friday and Cyber Monday, it is a global day dedicated to giving. Please consider donating to an organization –especially a local one - that is dedicated to assisting our veterans and military families.